I tested all of these classes for you! 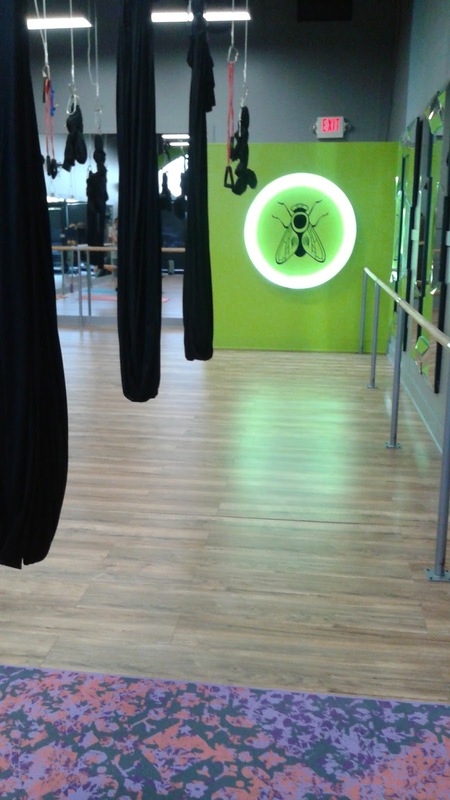 Barre Fly Breakdown: The very first class I signed-up for was the Barre Fly Breakdown taught by Laura. It was my first time at the studio and Laura was incredibly friendly and welcoming when I arrived. A few other people were there for their second class, so it made me feel a little better. 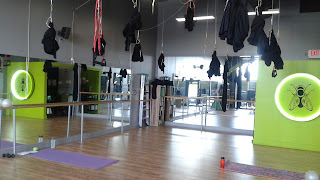 We spent 80% of the class working with the barre and 20% working with the aerial silks to do core work. 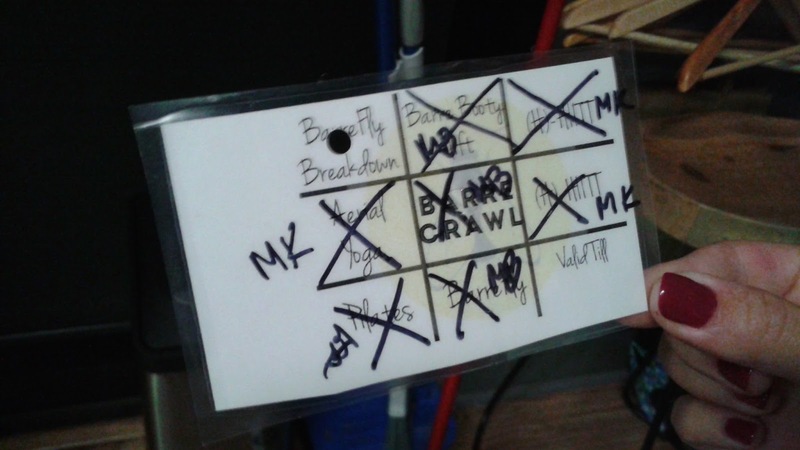 This class moves at a slower pace with a lot more explanation to make sure that you're doing the moves correctly. I left very sore, but the hour long classes didn't drag on and when we were done I couldn't believe that an hour had already passed. Barre: I took my next class about a week later. This class didn't involve working with the aerial silks and was modeled more after what I imagine a traditional barre class to be like. Megan was the teacher of this class and like Laura the week before she was incredibly welcoming and helpful. I struggled with the classes a little, I think I was doing some of the moves incorrectly and not getting as much of a burn as I could have. I woke-up the next day not quite as sore as I had been after Barre Fly Breakdown, but once again it was hard to believe class was over when it ended -- even though the work-out is hard, it doesn't feel like an hour. Barre Fly: The third class I signed up for was my first weekend class and the first time I took two classes so close together, I had only taken the Barre class three days before. This class was also with Megan, despite it being on a Saturday morning I was surprised to see only a few other people in the class. I had taken two other classes prior to this and was pleasantly surprised that we were doing new and different moves. (H)HIT: Make no mistake, this class is incredibly difficult. The two mistakes I made were not bringing shoes and not wearing a high-impact sports bra, a cute yoga bra is not going to cut it, there is a lot of jumping involved in this class. Half of the class used resistance bands threaded through the aerial hammock hardware to create resistance and spring for jumping. 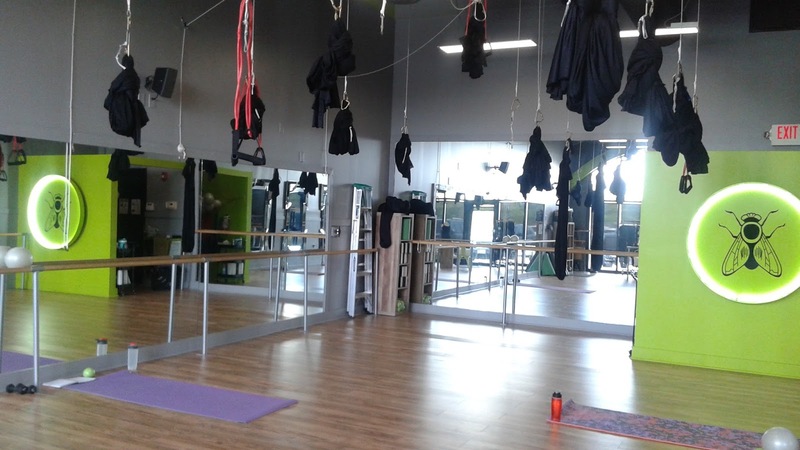 The other half of the class used the aerial hammocks for core work. I'm really not cut out for high intensity work, I'm pretty out of shape, so this was the longest half hour of my life and exponentially more difficult than any of the barre based classes I had already taken. If you want a really good cardio work-out, this is the class for that. Pilates: I've never taken a pilates class before, so I thought this one was interesting. One thing I've appreciated about this studio is that in every class I attended there was a wide range of ages and body types. 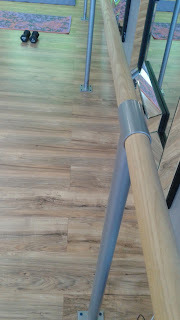 Pilates was the first class I attended where I was easily the youngest participant and also the first class where it seemed like the others were weekly attenders. 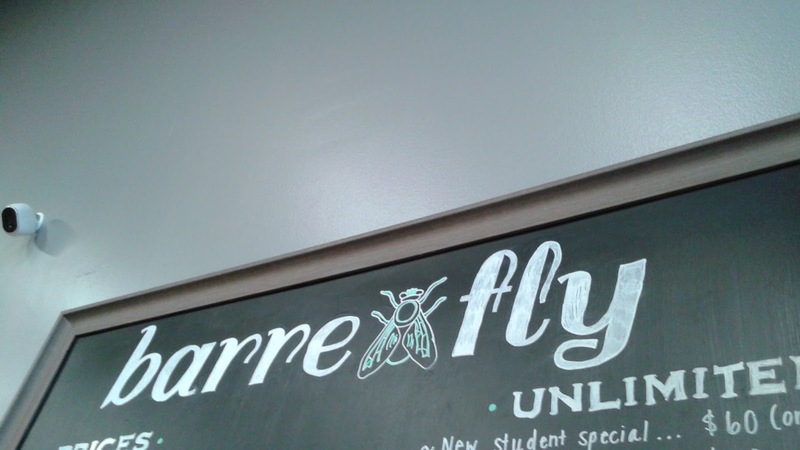 Pilates is only offered at Barre Fly once a week, so that's probably why. Barre Booty Lift: I'm already sore from my Pilates and Barre marathon on Thursday, but Barre Booty Lift is only 45 minutes. This class was also taught by Megan who is one of my favorite teachers here at Barre Fly, she's encouraging and helpful during the classes. Although there was a small amount of arm work in this class it mainly focused on the booty -- bonus points to Megan for her motivational booty playlist for this class. I wasn't quite as sore when I left this one. (H)HIT: This class is always taught by Michaela, although I knew better what to expect during this class, it still wasn't one of my favorites. I think as I incorporate more cardio into my work-outs this one would become a better fit for me. Aerial Yoga: Michaela also teaches the aerial yoga classes on Tuesday nights. Prior to my aerial yoga class at Barre Fly I had taken it once before at a different studio. Michaela did a really great job putting up with me, I was absolutely terrible at aerial yoga and spent a lot of time falling out of the poses all together and struggling to get myself back into them. Of all the classes I took I really enjoyed Barre Fly Breakdown, Barre Fly, Barre, and Barre Booty Lift. I appreciate that with the class pass I can take the other classes at some point to switch up my work-out, but overall I was very happy. 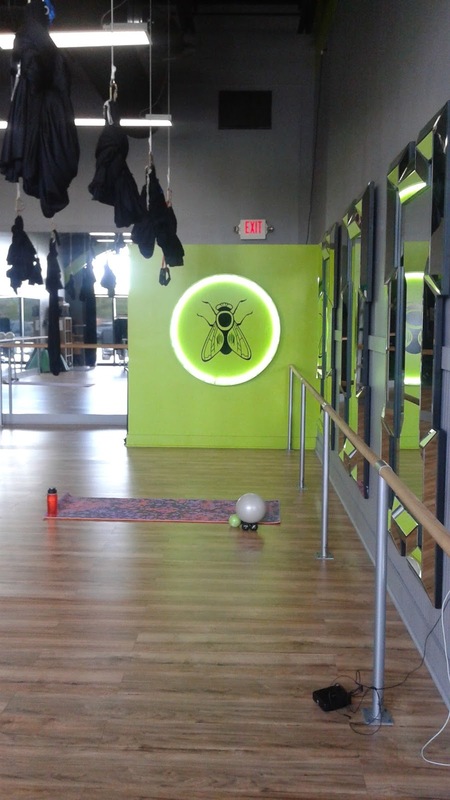 I was incredibly happy with the quality of classes that I took at Barre Fly, I've already signed myself up for another class pass. Although it will take a little longer for me to see the results of all of the hard work I've been doing at the barre, I know that the toning and definition in my arms and legs is going to become really apparent. I've left every class feeling sore, sometimes in places that I didn't even realize I should be working during a session. 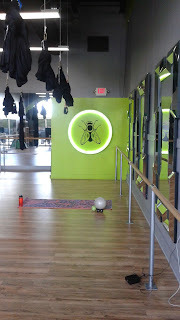 I've been recommending Barre Fly to all of my friends and can't wait to bring some of them to class with me next month.